As I find myself coming to the end of one cycle with Happy Hedgehog Post as a Brand Rep, new adventures are arising for our family. Sometimes adventures happen very quickly, and the next thing you know, you are putting one foot in front of the other. For my family, we are finding that after almost 11 years (in May 2017), we are picking up roots and replanting ourselves. We have been blooming and growing in Kentucky. We married in North Carolina and had our first son, Little Eagle. Then, we moved to Kentucky and immediately got pregnant with Little Fox. About 7 years later I got pregnant with Little Bear. So most of our children’s Early Childhood, walking the Waldorf inspired path, has been in one place. Now it is time to go on a new adventure together. We are moving to Amish Country, in Northern Indiana. Life will be different. We have lived on almost 4 acres in the country for the past 11 years, but we are moving into a rental (temporarily) in town. It is a quaint town, where I can walk to yoga and the farmer’s market within 5 minutes. There is a 26 acre park right in town as well. And, grandma lives a few streets over. At some point we will move back out to the country, once we find the right place. UPDATED to add : We have found a place to live and a workshop for our family business! Meanwhile, I have been asked by Amber at Hearth Magic to review her lovely two-part PDF download that she has listed on Etsy. Tonight I downloaded and previewed the learning guide. It is very thorough. 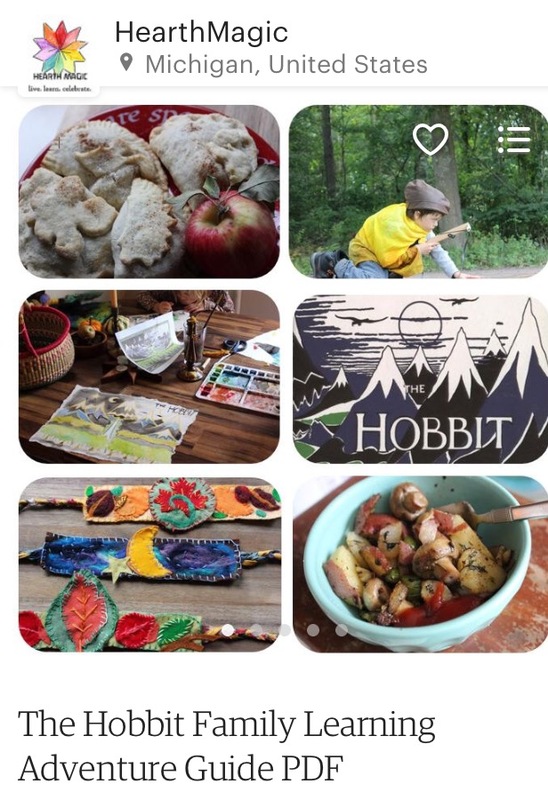 Our journey will include reading The Hobbit one chapter at a time and doing crafts, activities and pairing that with food! I am not sure who is more excited, the kids or me! So! Over the next couple months, as we move and settle in, I hope to post some of our adventures. Our journey. Until then, head over to Etsy and check out Amber’s listing. If anything Favorite her listing, as you stay tuned to see more of my review. All words, ideas and photos are copyrighted within this blog, from the beginning to the present, and in my existing accounts and links that I share. If you wish to share my stuff with others or elsewhere, please contact me. Let Respect lead us.